This is my first Christmas without my mother. I miss my mom more than word can ever express, but I have promised myself that I will not be sad and weepy, and that I will enjoy Christmas as I know she would want me to. My brother Bernard and I will be spending the day at my cousin’s house. All of the Middlebrooks family here in Atlanta will be there, and I know my mama’s spirit will be there with us. My mother did not like to have her picture taken. It was extremely difficult to get her in front of a camera so I have very few photos of her. This is one I have of her from a Christmas long, long ago. 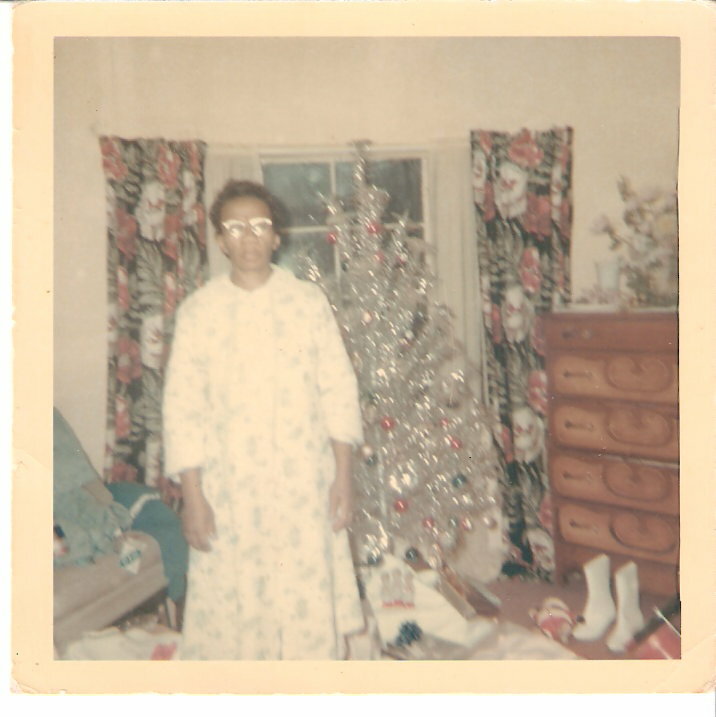 It did not have a date on it, but look at that tree… my “go go” boots there on the floor…and where in the world did she get those eyeglasses!! There are tears in my eyes, but a big smile on my face and a warm feeling of love in my heart. Merry Christmas mama. I miss you.